Thanks to my Vietnamese friend at the Stamp Club in Saigon, I managed to get my hands on Vietnamese new polymer notes. I helped purchased for them lots of new ASEAN 2007 architecture first day covers. I also managed to get the Vietnamese ASEAN 2007 architecture series. This 500,000 dong is very much different from the old paper note. I have been to Vietnam around 4 times, so I pretty much have their older paper notes. Luckily now I managed to get their polymer notes. Someone from Malaysia has kindly emailed me Saudi Arabia Monetary Authority's poster with all the new Ssaudi currency in circulation. It tells you all about the Saudi money, so I won't waste time. One of the things I did in Qatar was to go round the Old Souk (Old Market). Qatar has only one old market left and they mostly sell Qatari's old trade which was actually fishing and pearls. So you can buy all sorts of fishing and pearl related products. However they do sell other things which included old coins and paper currencies. One trader even sells ancient roman coins. But I was searching for the Doha Dubai Riyal because at one time these now two separate countries issued the same currency. But I couldn't find any at whatever price. 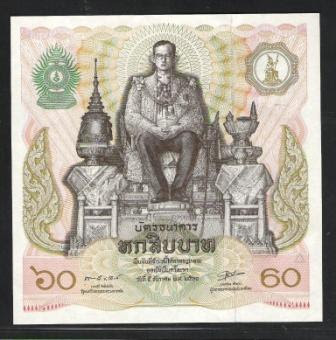 Surprisingly the sellers also sell a number of other currencies as well including this special Thai Baht note which commemorated the 60th year of King Bhumibol Adulyadej of either his birthday or his 60th anniversary on the throne. This is an interesting large square note and obviously could not fit any wallet without it being folded in 4 at least. I am back! For those who keeps up with my other blog www.bruneiresources.blogspot.com would have known that I was away for the whole of last week. I did not mention where in that blog but over the next few days, I will feature the country's currency notes as well as the country where I had to do a stop over. 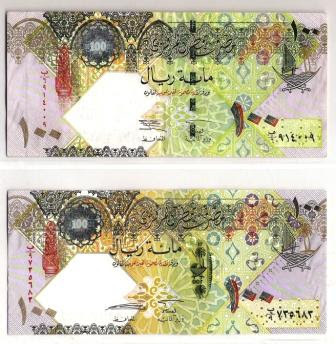 The first notes are Qatar's 100 Riyals. Qatar still maintained an effective fixed exchange rate tied to US dollars at 100 Riyal = USD36. Given the relative weaknesses over the last few months' of the US dollars, Qatar might have to rethink this policy in the future. Anyway, this 100 Riyal notes come in 2 versions - the regular paper money and the additional polymer series. Surprisingly until 1966, Qatar was using the Indian rupee as currency, in the form of Gulf rupees. When India devalued the rupee in 1966, Qatar, along with the other states using the Gulf rupee, chose to introduce its own currency. Before doing so, Qatar briefly adopted the Saudi riyal, then introduced the Qatar and Dubai riyal. The Saudi riyal was worth 1.065 rupees, whilst the Qatar and Dubai riyal was equal to the rupee prior to its devaluation. Until 1973, Qatar and Dubai jointly issued the riyal. However, following Dubai's entrance into the United Arab Emirates, Qatar began issuing the Qatari riyal separate from Dubai. I tried to go to the old markets in Doha, Qatar's capital to search for old currency notes. Either I am too late or there is just none available, I couldn't find them. It would have been interesting to find the Qatar and Dubai Riyal or even the Gulf rupees. Over the years, I have purchased and collected many old Brunei postcards as an extension of my paper money and stamp collections. This not only makes me a numismatist and a philatelist but also a deltiologist! Deltiology is the study of postcards. Anyway, when I saw this postcard on ebay, I was quite surprised. I had to have it and this postcard arrived yesterday. This view of the Jembatan Rangas or Clifford Bridge could only have come from one vintage point - the SOAS Mosque. But when was SOAS Mosque built and when was Edinburgh Bridge built? So this must have been around the time when SOAS was under construction and Edinburgh Built was not yet under construction. SOAS mosque was completed in 1958. I have an older photograph of Clifford Bridge here. Early Happy Chinese New Year 2008! I received this Australian miniature sheet from a fellow numismatist and philatelist in Oz Land. Thanks so much KAI! He was also very nice in sending me an Australian $1 proof coin too - celebrating the APEC which the Australians just hosted last year in 2007. I was going to wait until the Chinese New Year but I thought that would be too late. 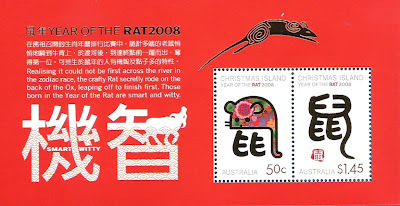 Here it is - the Australaian Post celebrating the upcoming Chinese New Year - Year of the Rats or Mouse or some look alike rodents. This postcard was posted from Brunei to USA in 1968. I bought it and this postcard has returned back to Brunei. You know in the 1960s, the Sungai Kianggeh was still wide enough that not only small boats can go in, even the big tongkang can go in. Before that it was even wider. The government ask anyone who wants to help in with the widening of the Jalan Kianggeh by coming up with some earth and get paid for it. People started bringing in earth by the boatfull and dumping it to the side of Sungai Kianggeh thus enabling the Kianggeh road to be built. That narrowed the river somewhat but it was the latest project in the 1970s that narrowed the Sungai Kianggeh to what we see today. 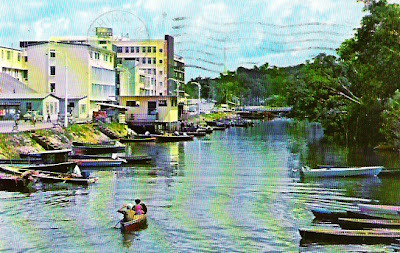 Anyway, this postcard showed the Kianggeh river in the mid 1960s when it looked wide enough. What's noticeable is the small hut in the middle of the river. This is where pigs used to be slaughered. There are a couple of buildings to the left of this hut. That's where Immigration Department used to be - this is the place to get your IC. The Indian National Philatelic Exhibition which concluded yesterday in the city after drawing record crowds from the 2nd, was marked by the release of a set of stamps featuring butterflies on the 2nd and special covers on the 3rd, 4th, 5th and 6th. The cover that specially interested me was the one released on the 5th, a day designated as Heritage Day, which featured what I learnt were called ‘copper tickets’. These “copper tickets” had been brought to the public’s notice even earlier. During the first International Philatelic Exposition to be held in Delhi, a Re.1 stamp featuring two ‘copper tickets’ was released on January 25, 1980 (my picture today). The ‘copper ticket’ was, however, not a piece of government issue paper; it was a piece of thin metal, a small copper token. Nevertheless, the Indian Postal authorities have long claimed it as the “world’s first postage stamp.” It was first issued in Patna on March 31, 1774 and was valued at 2 annas (12.5 paise). Each token bought when sending a letter made it possible for the letter to travel 100 miles in East India Company territory, carried by dak runners. Thus, being a medium of prepayment for postage, it gained the pioneer status it claims. It was in 1840 that Rowland Hill invented the first adhesive paper postage stamp in the U.K. Taken up with Hill’s invention, Sir Bartle Frere, then Chief Commissioner of Sind, in 1852 issued what are said to be the first postage stamps in Asia - pieces of paper embossed with a circular design in red, white or blue lacquer and featuring the East India Company’s merchant mark. These stamps were of half anna (3 paise) denomination and could be used for mail being sent within Sind and on the Karachi-Bombay route. 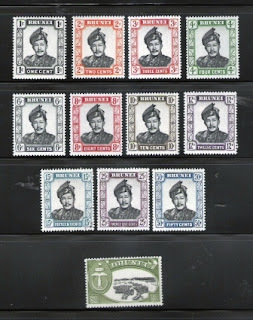 The stamps in later years attained fame amongst philatelists under the name `Scinde Dawk’ stamps. If anything, there is an orgasmic, if I am allowed to use that word, for me. This is the final complete set of all the Brunei stamp sets prior to the second world war that I need to complete. Before this I have the 1895 set, the 1907 set, the 1908 set, the 1922 set and the 1947 set. The missing 1924/1937 set had three stamps short. This the 1924/1937 series of Brunei stamps, the final 3 stamps arrived yesterday. This set had the most changes in its 13 year existence. For instance the 5c stamp appeared three times each a different colour. 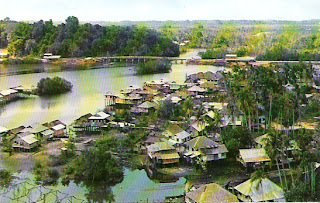 This set also introduced a new design of the Kampong Ayer and the capital. Take a good look. This is Sultan Omar Ali Saifuddien 2nd definitive stamp series issued in 1968. According to the catalogues, there were 3 series of definitive stamps. What's the difference between the three? There's hardly any as the designs are all the same! And that's the crux of the problem. The 1952 definitive which looked exactly the 1968 had $2 and $5 stamps but everything else looked the same. The only way to tell the difference between them is to take out the watermark reader and looked at the back of the stamps. The 1952 used script CA and the 1964 and 1968 used the block CA. How do you distinguish between 1964 and 1968? Well, technically one used glazed paper and the other used non-glazed paper. Hahaha..... Try to distinguish between the two. Anyway, if there is anybody out there who can tell the foolproof way of telling the difference, do let me know. Some were surprised my previous posting on the expensive airmail stamp at $800,000+ is still not the most expensive stamp in the world. So, what is the most expensive? This is arguable if you ask me. There are considered about half a dozen more or less stamps that are valuable. One will never the true value unless that particular stamp goes under the hammer duing an auction. The last to go on sale was Sweden's Three Skilling Banco, Yellow Color Error and Sweden Three Skilling Banco, Yellow Color Error. 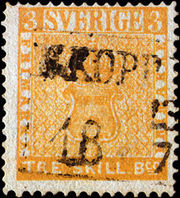 The three skilling stamp (yellow color error) was issued in Sweden in 1855. Due to a printing error, this stamp is printed on yellow colored paper (meant for the eight skilling stamp of the same set) instead of the usual green color (used for the three skilling stamp). One copy of the yellow error variety of this stamp was found in 1885 by a young Swedish boy in his grandfather's collection. It is a one-of -a- kind rarity, as no other copies have been discovered to date. In 1996 the stamp was sold to an anonymous collector for $2.3 million at auction. DALLAS — One of the most famously flawed stamps in U.S. history sold for $825,000 to a New York man who bought it slightly cheaper than the record price another "Inverted Jenny" copy fetched at auction last month. 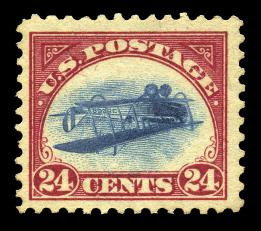 The rare 24-cent stamp, depicting an upside-down Curtis JN-4 biplane known as "Jenny," was sold privately this week to a Wall Street executive who did not want to be identified. But Heritage Auction Galleries president Greg Rohan, who brokered the sale, said the buyer is the same collector who lost an auction last month in which another "Inverted Jenny" sold for $977,500. The winning bidder was New York real estate magnate Charles Hack, Rohan said. Rohan said his client, whom he described as not being a rare stamp collector, was glad to get another chance at the prized misprint. "I suspect he's going to enjoy owning it and showing it to a few close friends," Rohan said. The mint condition red, white and blue stamp is one of the finest known surviving stamps from the original sheet of 100 misprints. The original 100 were bought at a Washington, D.C., post office in 1918. The Dallas auction house calls it one of the world's most famous rare stamps. Randy Shoemaker, founder of Professional Stamp Experts, said there are probably fewer than 1,000 collectors in the world with the money and obsession to seriously pursue such a rare item. "This is the Rolls Royce," Shoemaker said. "It's the most expensive airmail stamp in the world." Rohan said Heritage acquired its stamp from Sonny Hagendorf, a dealer from Scarsdale, N.Y. Rohan said the copy sold by Heritage is one of fewer than five to have never been hinged, meaning affixed with adhesive to be placed in a stamp album. In 1922, a trade exposition known as the "Malaya-Borneo Exhibition" was staged between the 31st March and 17th April 1922 on a newly reclaimed land at Telok Ayer. The exhibition was organised by the Chinese Chamber of Commerce with the participation of the Governments of the Straits Settlements, Kedah, Kelantan, Trengganu, North Borneo and Brunei. It was opened by HRH The Prince of Wales. The participating countries and territories issued their own stamps with overprints of Malaya-Borneo Exhibition. 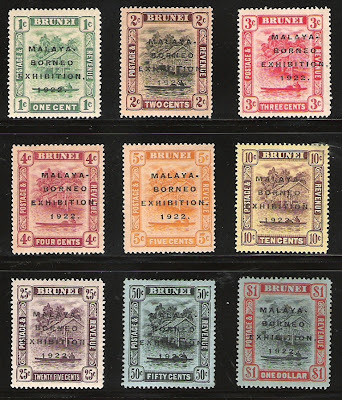 However both Brunei and North Borneo also added the year 1922 thus the overprints of these two sets read "Malaya Borneo Exhibition 1922". 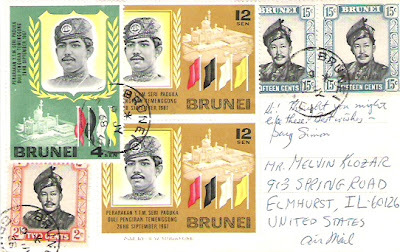 The above is the Brunei 1922 stamps. 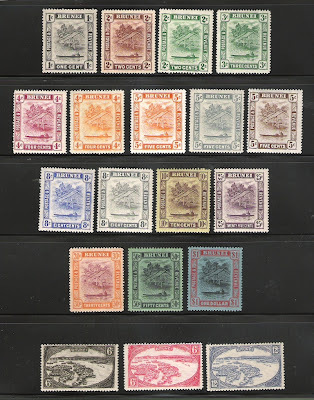 These stamps were taken from the existing 1908/1916 stamp stock. I have had all the set up to 50cents but I could not get the final $1 stamp. I knew someone who had a whole set but would not sell me just the one stamp. So I had to buy the entire set from him for $220 which is not a bad price really considering the CV Of the market. By the way, Telok Ayer is in Singapore. It was the site of the original Chinatown in Singapore.